Captain John Griffin was the sole survivor after his ship, the three-mast schooner St. Peter foundered in a Lake Ontario storm on October 27, 1898. Griffin’s wife and the ship’s crew of eight others were lost with the schooner. The 135-foot vessel was sailing from Oswego, New York to Toledo, Ohio with 700 tons of coal when it encountered a fierce early winter blizzard as it was approaching the Welland Canal. Buffeted by 70 mile-per-hour winds the St. Peter was driven back from reaching the canal. Griffin was forced to turn the schooner around and run before the wind. The storm grew in intensity. All that day and into the night the crew fought for their lives against 20-foot high seas, gale-force winds and freezing sleet. The storm was still raging when residents at Pultneyville sighted the St. Peter in a foundering condition. Word was sent to Charlotte and the tug Proctor steamed out with a lifesaving crew. 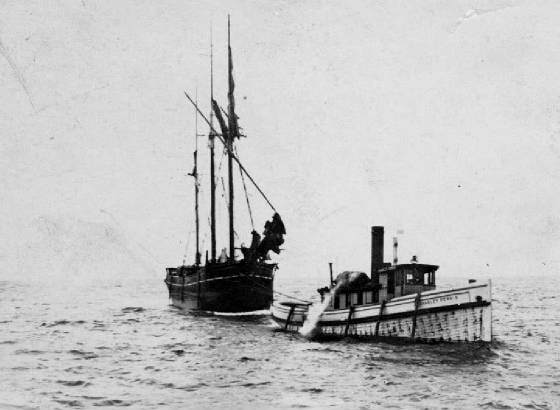 Even as the tug was approaching the St. Peter, the vessel sank. When they reached the scene, Captain Griffin was found floating unconscious. He was snatched from the water and revived. No other bodies were found. Sport divers who have visited the wreck say the St. Peter rests upright in 117 feet of water, seven miles northwest of Sodus. The St. Peter was launched at Toledo in 1873.